You armchair Rambos are sure to get a kick out of this one. Leatherneck is arcade war action at its most frantic. As the manual states, "The object of the game is to score points by surviving and advancing as far as possible through the treacherous jungle." The rules are easy; surviving is the difficult part. 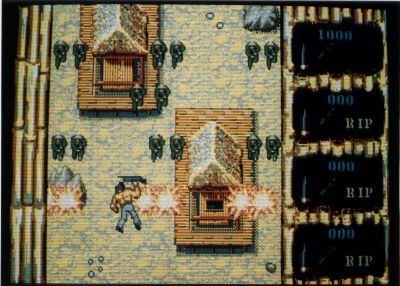 The instant your fighter steps onto the screen, he will be attacked by wave after wave of enemy soldiers, each soldier firing a rifle or throwing grenades. You also have to make your way past large gun emplacements that fire with deadly accuracy. Luckily the game can be played cooperatively by up to four players—and if you're planning on racking up a decent score, you'd better take advantage of this multi-player option. The first two players control their soldiers using joysticks plugged into the ST's joystick ports. To add players three and four to your battle force, you'll need to invest an additional $14.95 to purchase Microdeal's four-player adapter. Once you've flung yourself into combat, you have a choice of three different weapons: a heavy machine gun, which has long range, but slower firing; a light machine gun with shorter range but faster firing; and, of course, grenades. The graphics are splendid and the action is hot—very hot. If you can survive for longer than two minutes on your first attempt, you'll be doing better than I did. Also, the first time you play, be prepared for some realistic sound effects. Each time a soldier dies (and due to this game's fast action, there's always someone with his face in the dirt), you'll hear a bloodcurdling scream that'll make your hair stand on end if you're not prepared for it. Microdeal is certainly one of the most prolific ST game publishers (seems like every time I go out to the mailbox, there's another package from them), and Leatherneck's sizzling gameplay makes a good addition to their already large catalog. Recommendation: For shoot 'em up fans. "The object of Leatherneck is to score points by surviving and advancing as far as possible through the treacherous jungle."